It is good to be “warm-blooded” in the high peaks. Just ask a snake or a mosquito and see if either can convince you otherwise. To adventure atop the high peaks – miles of hiking and multiple skyscrapers of elevation gain, in the cold and the heat, in the wind and rain — requires great physical and mental endurance. But there is a price for freedom atop the Colorado high peaks. Our flexible, adaptable physiology requires lots of water when we exercise strenuously in the thin, dry mountain air, and not having it means more than mere suffering. 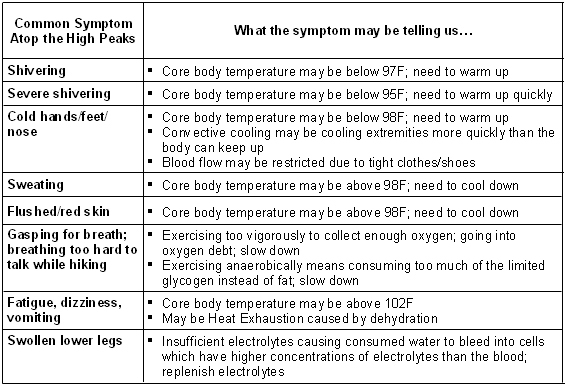 Scientists tell us blood temperature is merely a reflection of body temperature; what is important for high peaks adventure is our ability to maintain a stable temperature within the core of our bodies. This trait is one we share with mammals and birds, and contrasts with the variable temperature of insects and reptiles. A stable internal temperature means we can be active when reptiles are hardly able to move. It also means we have amazing endurance, since our energetic, heat-producing cells rapidly recharge. But to play atop the high peaks means to burn a lot of calories. Burning these calories generates body heat that must be eliminated through sweating. Burning these calories also requires oxygen, which requires exhaling volumes of water vapor. Through sweating and external respiration, we can have ongoing, massive water loss when playing atop the high peaks. Without sufficient water replacement, we can quickly become dehydrated and then become physically and mentally impaired. And atop the Colorado high peaks, even small reductions in our ability to think clearly and stay balanced on our feet can have catastrophic effects. Thermoregulation is the set of processes we use, unconsciously and consciously, to keep our body temperature within a very narrow boundary. Our thermoregulation goal is a constant core temperature of 98F that mostly means finding ways to bleed off the tremendous heat we generate by exercising vigorously. The human mechanism for converting food into mechanical energy is not very efficient; only 10-20% of the calories burned are used for work: muscle movement, heartbeat, digestion, brain activity, etc. The other 80-90% is expressed as heat, which accumulates in the body if not eliminated. If our internal core temperature moves more than a few degrees in either direction from 98F, our bodies will be impaired…more than 10 degrees could mean death. We discard extra heat in a number of ways, including conduction (heat flowing from inside body to skin), convection (cooling via air flow), and radiation (warming our clothes & surrounding air); but when exercising, most cooling comes from evaporation (sweat turns to water vapor and absorbs heat). And evaporation requires water. Dehydration can happen at any time atop the high peaks. Even on a perfectly cool, dry and breezy day, low air pressure at high altitude means extra hard breathing, and low relative humidity means lost water at every breath and via rapidly evaporating sweat. Conditions which are excellent for staying cool when we are working hard to cover ground and gain thousands of feet of elevation are a perfect trap for staying hydrated. The cool temperatures encourage us to push ourselves hard, which can lead to significant water loss. While the risk of extreme weather means we must prepare for the worst, our primary focus is on actively managing our hydration as a primary strategy for dealing with body heat. If we fail to manage our water supply or otherwise allow ourselves to get too hot or too cold, our brain and muscles and other organs will function sub- optimally, leading to problems with our physical ability to get back home and our mental ability to make good decisions needed to remain safe. Managing our body’s water is like managing our personal finances. We’ll be just fine as long as we don’t spend more than we bring in. Borrowing against the future is the root of all illiquidity. 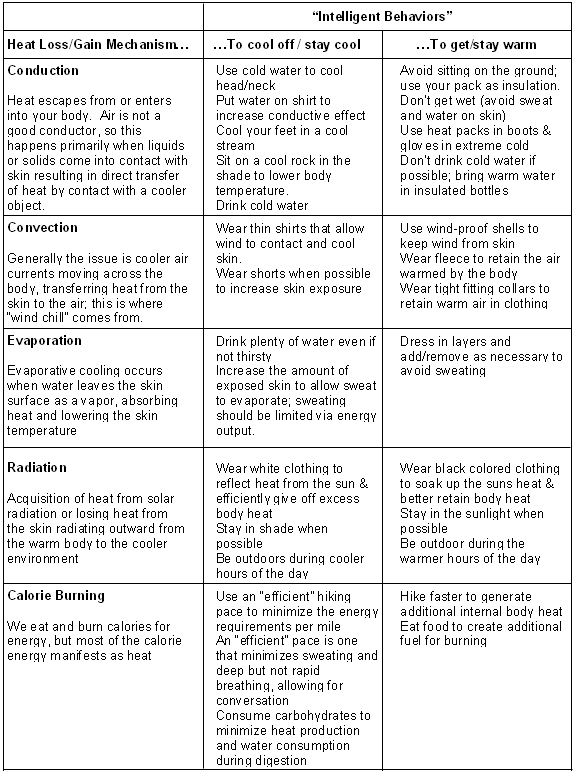 Dealing with body heat: tactics & tools to stay at 98F? These strategies will help us achieve our body temperature management goals of staying healthy while building in flexibility for dealing with unexpected conditions. In this way, we give ourselves every opportunity to succeed safely. Preparing for the worst doesn’t mean bringing gear to survive a summer blizzard or a lifetime atop the high peaks. Since we can and should always just go home if the weather becomes extreme, “worst case” means accidents that cause us to get wet/chilled (fell in creek) or lost/injured (requiring an overnight stay). Our standard gear kits should be organized to do just that while also bringing the stuff we need to replace lost water, electrolytes & carbohydrates and to utilize layers of clothing to manage body temperature. My gear is organized into 3 “kits” representing the 3 distinct seasons (Warm, Cool & Cold). By design, much of my gear overlaps multiple kits and so gets used a lot. 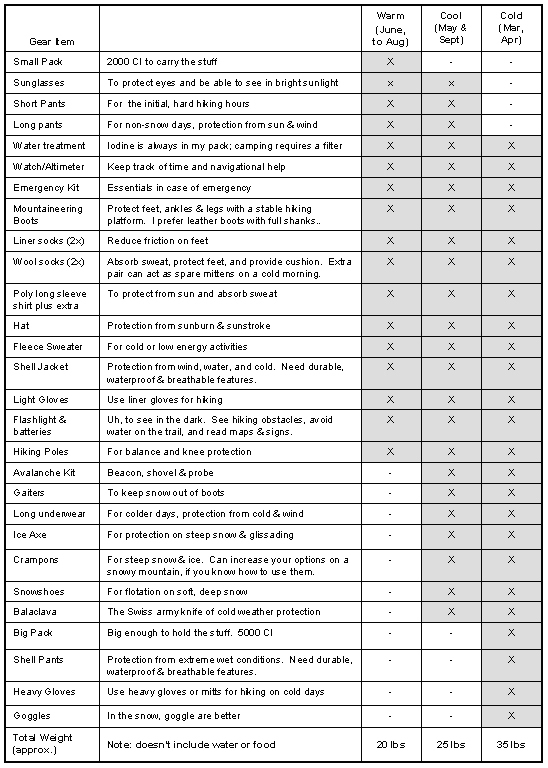 Deciding which “kit” to bring is rarely difficult, but if any confusion exists, I’ll check the recent trip reports and discussion boards for information on conditions to decide which “kit” is most appropriate. Water is a critical need that costs us 2.2 lbs to bring one liter too many and two tons of misery if we bring one liter too few. The math is easy. We need to conservatively estimate how much water we’ll need and then figure out whether we can find some on the trail. And we are always prepared to take advantage of found water to increase our water supply and activity flexibility. The experts say we should drink 6-12 oz. every 15 or 20 minutes of exercise, which is 24 to 36 oz. of water (or approx. 1 liter) per hour. Complicating our water planning effort are two facts: (1) in our high peaks adventures, we are only exercising vigorously a part of the time and (2) sometimes we cannot find water on the trail. Below is a summary of my rules that distinguish between water needs and rate of consumption in abundant and shortage situations. But this is just a starting point; each of us should become familiar with our individual water needs. Everybody has different water needs depending on fitness level, starting hydration status, body type and genetics. We should each learn about our own water usage patterns by doing two things: (1) ensure we are fully hydrated when we start hiking & (2) weigh ourselves before and after to assess water loss. And be sure to account for water consumed on the way home. If we are losing more than 2% of body weight (roughly, 2 liters of water), we should take steps to reduce water loss or increase effective water consumption during our adventures. We should plan to add approx. 1.5 liters for each liter of “lost” water weight (1 liter = 2.2 lbs= 1 kilogram). On the other hand, gaining weight may be an indication of drinking too much water, which can cause Hyponatremia (water intoxication). 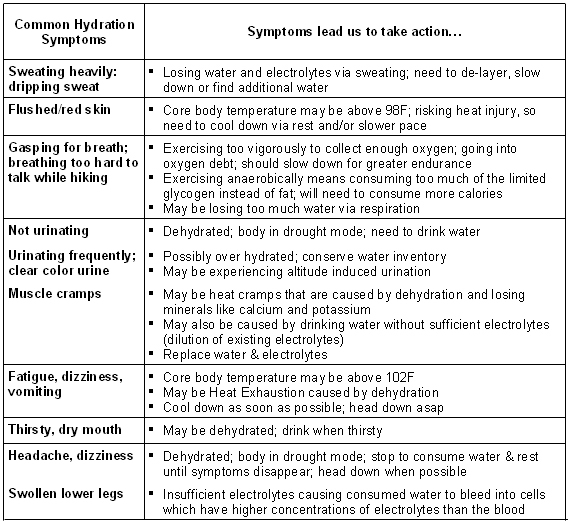 Hyponatremia can cause death and is caused by drinking too much water (more than was lost), too quickly (all at once vs. during the day), and without sufficient replenishment of lost electrolytes (without food containing sodium, in particular). Another important aspect of planning for water is anticipating when we’ll need water vs. when we’ll have water. If we bring all of it with us, then we just need to ration it. But if we plan to find water, we’ll need to be able to balance the drinking with the finding, e.g., drink a liter here so you can refill it before proceeding to where there is no additional water. 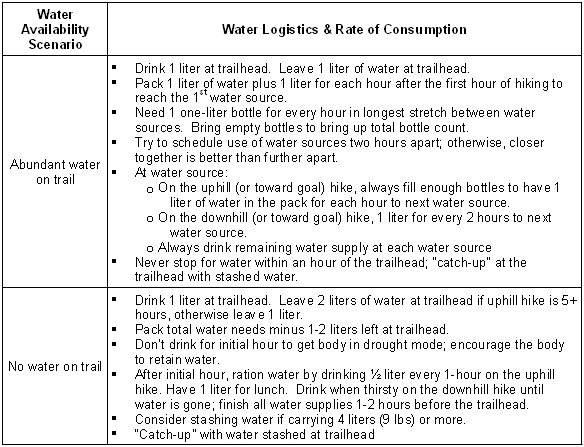 Based on where the maps indicate probable water, e.g., creeks, rivers, lakes, we can think through the logistics of when to drink and when to resupply to maximize the water obtained from the trail and minimize the amount carried at any one time. And be sure to use water containers that allow for rationing. Water bottles are very effective. Water backpacks (e.g., Camelbak) are more difficult to use unless you have most of your water supply in the pack and only replenish the pouch periodically. The last thing you want to do is to drink your water too quickly and then pee it away. And I don’t recommend recycling in this case. Our plan should be to consume only what we lose, consume it in small amounts throughout the day, and replenish the lost electrolytes along the way. Food impacts our water needs in two ways: (1) we need to replace lost electrolytes (sodium, in particular) if we are to retain and use the water we consume to be hydrated and (2) some food types are better than others for managing water. When we sweat, we lose electrolytes, including sodium. If we do not replace the sodium, then our blood will not retain the water we drink (the water will simply stimulate excessive urine production and the water will bleed into our cells, seen as swelling, since the cells will have a relatively higher electrolyte ratio). So we need to find a way to consume electrolyte replacement when we drink water replacement. Sports drinks and bars (e.g., Gatorade, PowerBar) do this by design. Salty snacks and other sodium-rich foods can also satisfy this need. Sodium also serves to increase our thirst and encourage us to drink more water, which is a challenge for some people. We just need to make sure we bring some sodium in the food (or drink powder) we bring. Besides, we need to consume calories anyway to keep the machine fueled. The experts say that we should eat 30 to 60 grams per hour of exercise, which is approximately 100-250 Calories. Since we typically are only exercising vigorously approx. ½ of the hike, we need approx. 50-125 calories every hour of our adventure, e.g., a Cliff bar every 2 hours. Sport drinks have approx. 200-300 calories per liter, which would be too much if we consumed sport drink instead of water the entire day. Of course, larger people need more food than smaller people. Normal food (read: not energy/food/nutritional bars) can have high water content. If we pack “normal” food, we should avoid fatty, high protein, high fiber items, as they will be more difficult to digest and can cause us to need additional water. Food such as trail mix (nuts and fruit) and jerky are not ideal. Sports food (e.g., energy/food/nutritional bars) is typically a good selection, but requires water to consume. Sport foods generally emphasize carbohydrates and include excellent electrolyte replacement. An excellent alternative is sport drink powder to add to water on the trail; sport drinks provide carbohydrate and electrolyte replacement that can substitute for or augment food consumed on the trail. 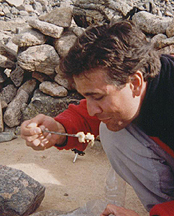 And we should consider the weight and space needs of food accessories. We should avoid, if possible, food that needs a stove or needs to be carried in large of heavy containers. Ideally, “The Plan” hiking time estimates are based on an “efficient” hiking pace that minimizes water loss by reducing our need to sweat and breathe. If the adventure goes as planned, we’ll be able to reach our objective with a minimum of necessary water / electrolyte replenishment and a low risk of dehydration. However, if the weather or other factors do not go as planned, we’ll have the option of speeding up for a while if necessary. If the storms are coming in earlier than expected, we’ll need to finish earlier than planned. If we got a late start or took a wrong turn, we’ll be able to speed up to reduce the deficit. 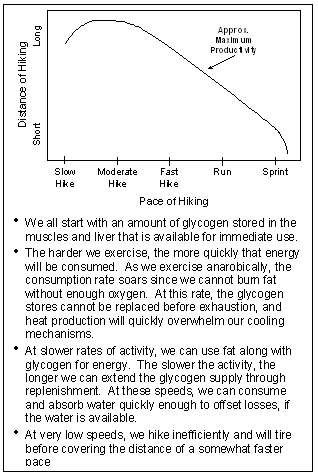 We should be able to hike faster than the “efficient” pace in exchange for higher water consumption and lower endurance, and sometimes we’ll need to do it. However, this is generally a short-term solution to find small amounts of additional time. If we find ourselves needing significant additional time due to very late start or very early poor weather, then to “yield and overcome” would be to go home and try again another day. Please see “hiking speed management” for more detail on this subject. By thinking ahead to bring the right resources and build in enough time, we are able to focus on staying healthy while building in flexibility for dealing with unexpected situations. In this way, we give ourselves every opportunity to succeed safely. 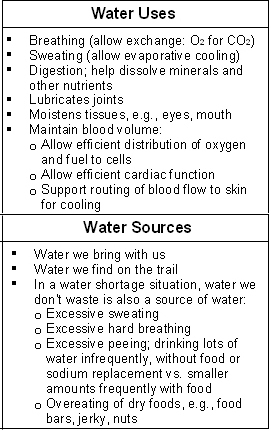 Once we are on the trail and the adventure has begun, we need to employ tactics and tools to manage our body temperature and hydration. There are two general types of thermoregulation methods: physiological and behavioral. However, since we can (and often do) behave in ways in violation of our temperature management goals, we need to segment the behavioral category into good and bad behaviors. So we have three basic heat regulators at work in our efforts to remain independent of the environment. Physiological regulation (the body doing its thing automatically) – the body makes an effort to manage its core temperature through changes to its physiology, such as sweating to cool off or shivering to get warm. 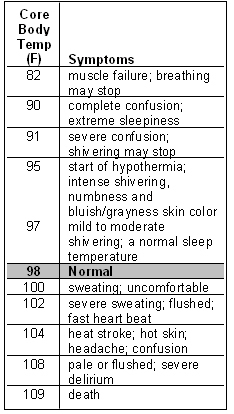 This is very helpful in that we don’t have to actually monitor body temperature; we can just monitor the body’s reaction, e.g., sweating, shivering, hands/feet cold, skin flushed red. In addition, the body will make clear, directly and indirectly, when it wants more food and water, as long as we know the signs. Intelligent Behavioral regulation (mind and will in support of the body) – based on experience and awareness of the body’s efforts to maintain core body temperature, we can take steps to aid those efforts. Occasionally, these steps are necessary simply to survive, but, normally, these steps are done simply to minimize water usage and to keep the body functioning optimally (not too cold/hot, not dehydrated, etc.). Unintelligent Behavioral effects (sins of the mind or will against the body) – unfortunately, we do make poor decisions to act against our other temperature regulation efforts. It has happened that we have failed to bring/find enough water (and lost the ability to cool through sweating), hiked too fast (and lost a lot of water by sweating profusely & breathing too hard), wore too much clothing (to stay comfortably warm but ended up sweating), stubbornly refused to stop to put on a rain jacket in a rain shower (and could not hike fast enough to overcome the heat loss), and committed other sins against the body. In managing body temperature, we need to be mindful of actions to take and those to avoid. Normal human body temperature is maintained within a narrow range by sensitive temperature control centers in the hypothalamic area of the brain that function like a thermostat. Heat produced within the body is dissipated to the environment so that a temperature between 97F and 100F is maintained. 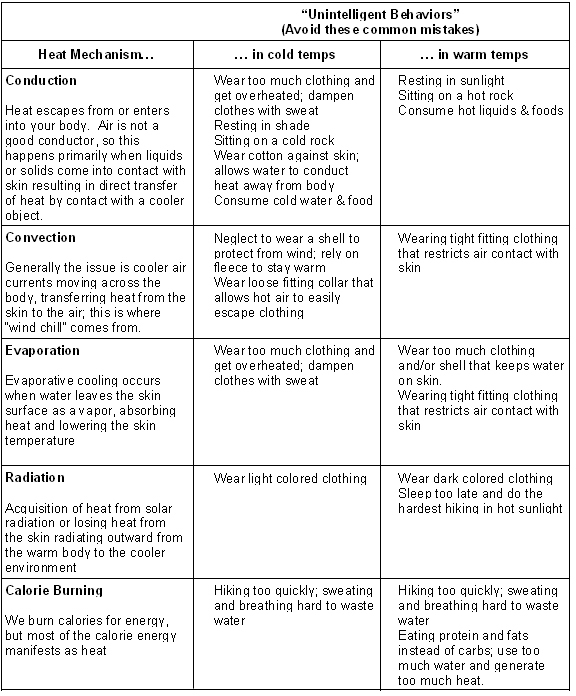 In temperature regulation, the mechanisms that either are used by the body or affect its function are “conduction”, “convection”, “radiation” and “evaporation”. Conduction is the flow of heat energy from regions of warmer temperature to regions of cooler temperature. This includes the conduction of heat from the center of the body to the skin surface. This also includes the conduction of heat away from the skin to the air surrounding the skin, creating a “private climate” about 3 mm deep. It also includes other situations such as cooling our feet in a cold creek or being chilled by wet clothes on a cold day. Convection is the movement of heat by currents in the medium, e.g., wind, blood. For the body in air, convection occurs as the private climate (see conduction) is replaced with cooler (or warmer) air via wind or “natural convection” from warm air in the private climate rising (heat rises) away from the body. Within the body, blood convection is used to move heat from the muscles to the body core and then to the skin. Radiation is the emission of electromagnetic energy via infrared wavelengths. The sun puts out a bit of infrared radiation which can be absorbed by the skin or clothes; the rate of absorption depends on the color (wave length): darker colors absorb relatively more heat than light colors that reflect more of the heat. The body also radiates heat outward, heating our clothes and the surrounding air. Evaporation is simply the change of phase (water to water vapor) of sweat. In addition to sweat, however, the body also loses water vapor during respiration. The volume of air inhaled in each breath must be humidified by the body to saturation in order to be used efficiently for transferring gases. This vapor is then exhaled, resulting in an evaporative loss, which also provides a cooling effect. When exercising vigorously, our body generates up to 15 times more heat that when at rest. To keep internal body temperatures stable, the body automatically attempts to cools itself by routing blood flow closer to the skin (seen in flushed or red skin color) and by sweating that is intended to evaporate for a cooling effect. The increased blood flow to the skin means that there is less blood flow to the working muscles. Since sweat comes from the blood, increased sweat means that the blood levels decrease and blood becomes thicker and harder for the heart to pump. Thicker blood creates the cardiovascular response of a higher heart rate, and also results in decreased oxygenation of the working muscles. Atop the high peaks we can have a tug of war between the working muscles, needing nutrients and oxygen for fuel, and the hypothalamus cooling the body. When the body is in distress, we can discern the problems from the symptoms they produce. Our response will hopefully fall into the “intelligent” behavioral regulation category. How we manage this dance is a personal decision. I organize my body and pack by think of my clothing/gear as being in 3 separate categories: (1) the stuff I don’t expect to put on at all and therefore don’t need handy (rain jacket, fleece, gloves), (2) the stuff I won’t put on until the pace and exertion level decreases (e.g., long pants, hat), and (3) the stuff I usually won’t take off all day (e.g., shorts, socks, shirt). Using the approach below, I sweat only a little and have to tolerate just a bit of cold during the day. The biggest problem is failing to stop hiking to deal with clothing layers and water consumption. Sometimes it is a result of peer pressure to keep going, but often it is our own sense of urgency that keeps us from drinking often enough or changing clothing layers quickly enough. As a part of the “yield and overcome” mindset, we must understand that managing our body temperature is a part of the trip. And we value the trip and the destination. If we’ve packed and dressed well, we can modify our layers in seconds; there is no good reason to wait for a scheduled break. And, if we can manage our temperature well, we can minimize our water needs atop the high peaks. Managing hydration is a balancing act between water sources and water uses. We have to come to understand for each adventure whether we have abundant water or water shortages. In abundant water environments, we need to focus on drinking plenty, early and often. With abundant water, the key will be collection, treatment & consumption; but then we’ll be free to exercise more vigorously. In water shortage situations, we need to focus on designing our physical efforts to match our available water supply. In a water shortage, the key will be rationing and strictly utilizing an “efficient” hiking pace to maximize the effort per liter of water. To maximize our likelihood of staying well hydrated (and at peak performance), we should manage our water consumption as follows, or according to what works best for our own physiology. Dehydration is an issue with a long tail. Even if we succeed in our adventure goal, we can still come home with a 2-day reminder of our failure to stay hydrated. And usually, dehydration is a result of carelessness vs. necessity. We should attempt to consume only what we lose, consume it in small amounts throughout the day, and replenish the lost electrolytes along the way. If we have made a mistake or gotten unlucky, and are going to run out of water, we need to ration our water but not horde it. We need to drink when we are thirsty. It is better to drink the water when we’re thirsty and postpone the heat illness issues as long as possible. We can also look at the route to understand where the shade will allow us to hide from the sun’s heat. Hiking below treeline and off of ridges will provide some protection from solar radiation, while hiking along exposed ridges and on peaks will expose us to the full force of the heat. Lastly, it is better to turn back than push a dehydration issue. The mountain will wait for you.